Better than pralines and all manner of sugar for an ultra-sweet high when you are in New Orleans is a trip to … no, you did not guess! 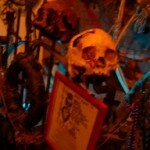 … the Voodoo Museum at 724 rue Dumaine in the Quarter. My travel companion and I felt the vibe immediately and were so delighted to be in the energetic “presence.” In additional to a couple of pleasingly shadow-filled rooms of voodoo and zombie-related paraphernalia, we encountered a couple of experts on zombie matters. Druid and Voodoo priest, John T. Martin, greeted us and historian Gerald “Jerry” Gandolfo, whose brother Charles Gandolfo founded the museum in 1977, proceeded to make our heads spin with stories and pointers on the differences between Haitian and New Orleans voodoo. 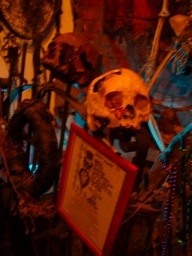 Marie Laveau presides over reception, casting a regal eye on all comers, and snakes galore ensure that Le Grand Zombie has a place of honor in this spooky warren, along with altars to Voodoo Queens and other spirits. Plenty of skulls and crossbones too, all rather reminiscent of the city’s swashbucklin’, death defying past. I’m going on the cemetery tour so that I can knock on Marie’s door, which swings both ways. I have want to offer her an homage and a thank you from the cast of Dead Love.